Aluminum Steering Bellcrank Set (w/bearings) for Slash/Rustler/Bandit 2WD Only (blue) Discounts Apply ! 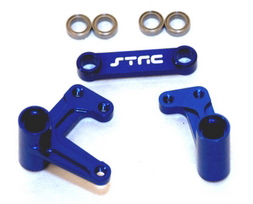 SPTST3743XB - Aluminum Steering Bellcrank Set (w/bearings) for Slash/Rustler/Bandit 2WD Only (blue). Our CNC Machined Aluminum Steering Bellcrank system features a 3 piece design featuring single CNC machined solid aluminum main bellcrank, providing slop-free, precision steering response (unlike other 2 pieces bolt together design of other manufactures). The steering bellcrank set also comes with 4 pieces of bearings for smooth steering operation, ST3743XB.